In June, UCL Phd student, Valérian Turbé and i-sense researcher, Dr Jennifer Brookes visited OJ-Bio’s research and manufacturing site in Japan, and Shizuoka University, to learn more about the development and manufacture of Surface Acoustic Wave (SAW) technology for disease diagnostics. Jenny and Val are both members of the McKendry lab, based at the London Centre for Nanotechnology in UCL, working in collaboration with OJ-Bio on their platform towards developing novel SAW sensors for the detection of infectious diseases. They spent the first two weeks with Professor Kondoh at Shizuoka University, Hamamatsu, where they were given the exciting opportunity to visit the surface wave electronics laboratory. They benefitted from the expertise of Professor Kondoh, who heads the lab and was one of the first to develop SAW theory. 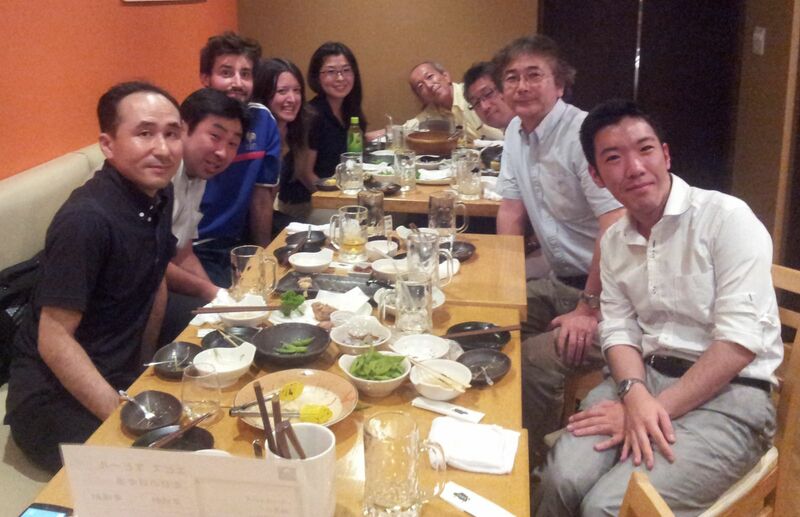 "We were welcomed as soon as we arrived and the chance to discuss the history and theory of acoustic wave sensors with Kondoh-sensei, one of the top experts in the field, was unmissable," says i-sense Postdoctoral Research Associate in the i-sense McKendry group, Dr Jenny Brookes. The second visit was to OJ-Bio's parent company, Japan Radio Company (JRC) in Kamifukuoka to meet OJ-Bio’s Technical Director Dr. Hiromi Yatsuda, a world expert in the field who holds over 60 patents in SAW technology. Dr Yatsuda hosted them at the company site and highlighted sensor design, development and manufacture. OJ-Bio are pioneering the development of innovative mobile phone connected diagnostic technologies based on their surface acoustic wave technologies. The company was formed in 2009 between UK based Orla Protein Technologies and Japan Radio Company, bringing together advanced coatings and microelectronic telecommunications technologies. OJ-Bio are key partners in i-sense and their collaboration with Professor Rachel McKendry’s group at UCL builds upon a major NIHR i4i programme between OJ-Bio and UCL, UCLH Biomedical Research Centre and UCL Partners to develop next generation mobile diagnostics for HIV with wireless connectivity. "OJ-Bio were pleased to be able to facilitate this fantastic exchange visit for Jenny and Val. It provided a great opportunity to further strengthen our knowledge exchange and collaboration with the UCL team," says CEO of OJ-Bio, Dale Athey. "We are delighted to work with OJ-Bio towards the development of mobile phone connected tests for HIV. Our young researchers have benefitted enormously from working in partnership with OJ-Bio. This visit to Japan has helped to develop their knowledge, skills and understanding of industry. We look forward to welcoming OJ-Bio researchers to London in the near future," added i-sense Director, Professor Rachel McKendry. OJ-Bio Ltd is a joint venture between Orla Protein Technologies Ltd and Japan Radio Company Ltd.